We’d love your help. Let us know what’s wrong with this preview of Leading Congregational Change by Jim Herrington. A Leadership Network Publication With this much-needed handbook, the authors brilliantly combine their experience guiding dozens of churches through the change process with both the study of Christian disciplines and the sophisticated understanding of such important business thinkers as John Kotter on leading change and Peter Senge on learning organizations. In this eminen A Leadership Network Publication With this much-needed handbook, the authors brilliantly combine their experience guiding dozens of churches through the change process with both the study of Christian disciplines and the sophisticated understanding of such important business thinkers as John Kotter on leading change and Peter Senge on learning organizations. In this eminently readable book the authors have distilled their insights and practices into simple but powerful concepts for leading congregations, whether long established or recently formed, through profound change. To ask other readers questions about Leading Congregational Change, please sign up. Throughout the rest of the book, the authors address the three distinct components of the Congregational Transformation Model. First, in chapter two, they address the component of "Spiritual and Relational Vitality" and it is the imperative stage of entry into change. Here the authors explore the heart of the transformational process – developing a congregation’s unified passion to pursue God’s vision for their lives. Second, the book explores the eight step "Change Process" in chapters three through five. This sequential process, particularly the core stage of developing and communicating the vision and “visionpath” for the church, gives structure and sequence to the journey from the present reality to the future goal. Finally, the third component of the Congregational Transformation Model represents a set of “Learning Disciplines.” In chapters six through ten, the writing team investigates the four “disciplines” of creative tension, mental models, team learning, and systems thinking. These turn out not so much to be practices as much as principles for creating an environment that develops a congregation committed to change. The book concludes with a chapter encouraging the need for leaders equipped to navigate each of these three concentric phrases. Throughout the book, the authors presented numerous inspirations behind their model. Rather than touting an entirely new theory, process, and tools, the writing team researched current programs and paradigms, integrating them into a system that encouraged congregational transformation. The diverse set of roots, including Henry Blackaby and Claude King's Experiencing God, Peter Senge’s The Fifth Discipline, John Kotter’s Leading Change, and even attention toward congregations such as Willow Creek and Saddleback, speaks toward the well-rounded nature of the process in this book and inspires confidence in what the authors share. In addition to the foundations of the material, one of the more refreshing contributions from this work is their repeated emphasis on the leader’s personal transformation and spiritual vitality as part of the necessary groundwork for change. This model does not find its power as merely an agent to change programs or ministries, but in that it first sets out to fortify the hearts and minds of those initiating the change itself. In emphasizing this stage of the process, and indeed every stage, the authors made it clear that this process is not a fast and easy one. They encourage proper attention and time given to each step along the way. Although the model presented in the book was developed based upon the experiences of numerous churches, unfortunately there still exists a denominational barrier in the test group that inhibits the principles from being universally supported. Though there did not seem to be much that could not transition over to other churches and denominational structures, it does restrict the application somewhat. Broader buy-in and more opportunity for application could have been reached if the book presented more case studies or detailed illustrations of how different churches interacted with and worked through different stages of the process. One of the great insights from the book comes through the emphasis on maintaining momentum. Often congregations begin the vision process but stall before completion. The book does a superb job in warning of the coming conflict that will be provoked because of the congregation seeking God's vision. The belief that all members will accept and support the change process once the vision is given is untrue and unsubstantiated. Even changing course toward a godly vision will involve conflict. Jim Herrington, the main author, offers Leading Congregational Change as a guide for congregational transformation based on the findings of Union Baptist Association in and around the Houston area of Texas. This study examines Southern Baptist congregations and their growth via baptism. Herrington hopes to renew the mindset of leaders in the church by encouraging change over holding fast to the ways of the past. 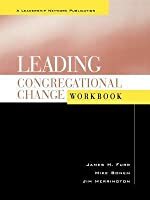 Instead of beginning the book like most Biblically based Christian leadership volumes Jim Herrington, the main author, offers Leading Congregational Change as a guide for congregational transformation based on the findings of Union Baptist Association in and around the Houston area of Texas. This study examines Southern Baptist congregations and their growth via baptism. Herrington hopes to renew the mindset of leaders in the church by encouraging change over holding fast to the ways of the past. Instead of beginning the book like most Biblically based Christian leadership volumes, Herrington largely skips past the intricate role of the Holy Spirit in transformational congregational change. He dives right into the secular leadership traits and trends that support his broad argument that things have to change. Rather than taking the approach of working through the cells to change the whole, Herrington believes that change must start in the association. 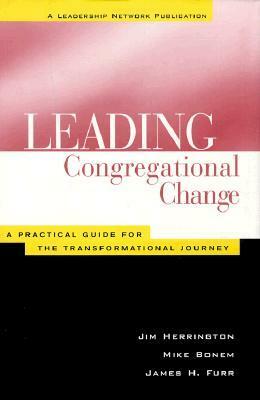 The “paradigm shift” in the first chapter should have referenced the trend that churches are aligning themselves less and less with their denominational association than ever before; Thus, holding to the idea that change can be effective in Southern Baptist churches only when initiated from the Southern Baptist Convention (or the Union Baptist Association) is very outdated and promise-less. When it comes to the buzzword of “vision,” Herrington begins to unfold his idea of a “vision community,” which he says, “is a diverse group of key members who become a committed and trusting community in order to discern and implement God's vision for the congregation. The vision community should be a part of the change process from beginning to end.” He is essentially saying that vision comes from a group of people, or a committee. Since this book talks about “leading” congregational change, this is an interesting disagreement with most popular works on the topic of vision. Usually, leader-centric writers agree that vision initially—begotten of God—is brought into an organization by the senior pastor. It is then the role of this senior leader to stir about this vision amongst his staff, and eventually the congregation. This is a typical, top-down approach to cultivating a God-given vision. Herrington’s approach takes this away from the congregation’s main leader and divides it up into a group of people. This is odd because it goes against what he said in the beginning of the book about breaking away from the old ways of doing church. He even makes it optional for the pastor to be a part of the vision community, which is outrageous. In the following chapter, Herrington talks about the vision timeframe. A continuing concern is that he says the timeframe for a vision is 3 to 5 years. Usually, visions last longer than a few years. He must be casually referring to shirt term strategy when mentioning vision. With the word “alignment,” Herrington is reminiscent of Thom Rainer’s Simple Church, in which both authors talk about moving the pieces (ministries) of a church along the vision. Rather than the ministry shaping the vision, the revolutionary way to think of leading a congregation toward change is to pitch the vision in a way that all of the moving parts of the church as affixing themselves to the shared vision. Particularly useful in this book is the information on “mental models” or paradigms. Herrington highlights the usefulness of understanding how different people think about how an organization should run. This principle can be found in most every relationship. There are certain expectations that people may have for churches and the leader’s God has brought to run them. Leading Congregational Change is, according to the authors, a summary of practices leading to large degrees of growth and congregational shift in several churches of the large Union Baptist Association located in and around Houston. The authors served in various capacities in the UBA. The information upon which this book is based is largely anecdotal and was collected in the late 20th Century leading up to the book's publish date in 2000. One might expect a book outlining strategies for congregational transformation to give substantial space to the mission of the church as articulated in the Gospel as well as to the work the Holy Spirit does in and through believers for the achievement of that mission. Leading Congregational Change does neither. I made it through 5 of the book's 11 chapters. The introduction promises that the authors will provide principles rather than formulae in order that the book might be useful in a variety of ecclesio-political models. As I made my way through their eight stages (if "stages" sounds formulaic, it is) of change-oriented leadership model, I read much that was based upon Maxwell, Warren, and Hybels--corporate leadership model applied to churches trying to become more seeker-sensitive--but virtually no mention of the Holy Spirit. I kept waiting to find discussion on ecclesiology (if a congregation is in need of change, perhaps it should consider its raison d'être? ), or the role of the Holy Spirit in leading the church and outfitting its members to be the body of Christ. I finally flipped to the index to see when these might appear only to discover that the Holy Spirit appears but once--on page 111. Spiritual gifts are not discussed at all, though the Myers-Briggs and the DISC Inventory are (I find these tools very useful, but it seems that gifting belongs in this discussion, perhaps at the point where the authors encourage recruiting and empowering lay leaders). On the positive side, the authors provide a helpful foundation for congregational change in the first chapter when they talk about the need for spiritual and relational vitality between the leaders and the congregation. If either is lacking, attempts at change will nearly always be disastrous. Though the book is formulaic, it is not without helpful ideas. One such helpful idea is the creation of a "Vision Community" to think through the direction of the church. I say this is helpful because it intentionally involves the congregation (via a representative sampling) in the process of determining direction. What you see is what you get from the title of this book. The authors offer both principles and a model to journey through the process of leading congregational leaders in bringing about needed healthy changes to both systems, models and practices within a congregation. Even if you do not follow the specific model for finding a "vision path" that is outlined in this book the principles and the graphics can help you in educating leaders and disciples within the congregation about how to think abo What you see is what you get from the title of this book. The authors offer both principles and a model to journey through the process of leading congregational leaders in bringing about needed healthy changes to both systems, models and practices within a congregation. Even if you do not follow the specific model for finding a "vision path" that is outlined in this book the principles and the graphics can help you in educating leaders and disciples within the congregation about how to think about change in a more positive light. This book has opened me mind to a new leadership model that has the potential to be more powerful than the traditional strategies churches continue to pursue. Herrington challenged my thinking and preconceptions. He encouraged me to look at change differently than I had ever considered. I would 100% recommend this book to anyone who is called to a lead a church someday. It will change your perspective and cause you to reconsider how the church reaches the community. This book was a chore to read. For such a short book it was painful and time consuming to get through, not to mention the content just wasn't all that groundbreaking. I am having to read a bunch of Leadership Network Publication books for class and they are just a bore and borderline useless. I'm being generous giving it a 2 star rating. Reading this book was a task. The information was good and I think it will be helpful, but for some reason it seemed like a major investment of time and effort for a 160 page book. It was thought-provoking, but really fairly dry. I think it could have been much less technical and still delivered the message clearly. This is a dynamic and honest book about the challenges and issues that any leader seeking to bring transformation to a church will face. The book works to bring in a number of great illustrations that help to put flesh on the theory to move it from the classroom to what we see and experience each day. A great read, highly recommended for church leadership. A good, practical guide for churches’ strategic planning or long range planning processes. Although the name sounds boring as can be, I found the book fascinating. Changing the ideas of what church is to match today's ever-changing culture.